This is nice quality comforter, purchased this for myself. Cannot beat the affordable price, also order shipped fast and arrived without any issues. The perfect solution for staying cozy all year round, this down-alternative comforter is made of luxurious 240-threadcount cotton that lends a plush feel to every night's sleep. Polyester fill and crisp box stitching maintain a balanced feel that keeps you warm on cooler nights without overheating during warm ones. FIrst i'll start with the good. The comforter was so warm and cozy, the perfect amount of warmth and weight. With our old down comforter I would wake up sweating in the middle of the night, with this one I had a comfortable night's sleep. And for the price, I felt the quality was quite high. The reason we got this comforter was because my husband is very allergic to down and so I looked for something down-alternative. After one night's sleep my husband woke up unable to breathe and now we cannot use the comforter. I could not figure out why until I noticed this morning that it says this down-alternative comforter contains down! I feel this is false advertising. IMO down-alternative means NO down. This is why I gave it four stars instead of 5. I loved it, but now we cannot use it. So if you're looking for a down comforter, this is great! If you are allergic to down do not buy this product. Comforter is a perfect size, 102inches x 86 inches, for the king size bed. Light weight, soft and an excellent bargain. It truly is an all season breathable comforter. Folds for easy storage. I have done my research as always, before I bought this. I have read all the reviews and I must say that I don't get some of them, because the product is great. It arrived quickly. I thought that it looked a bit thin, but once I set it up over my king size bed, put on the new duvet cover on it and voila, a perfect comforter. It is warm. It is nice, snug and cozy and keeps me warm at night. It doesn't make any weird sounds. Three days into my pleasant journey with this thing my son sneaked into my bed and peed in it. So I washed it at a laundromat and I don't really think that the stuffing has shifted much. It is still the same, now even fluffier and I absolutely love it. The price is great and the product is excellent. It fits the bed great, it even hangs on both sides, it is the perfect size and it really is a great comforter. end of story! The fabric is soft and luxurious, the filling is soft and it isn't too hot to use in the summer. The perfect alternative to down. Great Buy! I was lokoing for a queen-sized down alternative comforter. The customer reviews, combined with the great value, prompted me to purchase this comforter. PURCHASE ONE SIZE UP FOR THIS COMFORTER. I bought the king size for a queen size bed and it fits just right. I purchased a king size hunter green Solid 205 Thread Count Duvet Cover Set to go with this comforter and it fit inside the duvet cover just right. Also, the shams that came with the king size set were standard, which worked out nicely. I was worried that the set might come with king size shams and they wouldn't fit the bed, but they were standard, which only added to the versatility and value of the set.. The comforter is warm, but not too hot. The down alternative fill acts as natural down does and helps to keep your body temperature regulated throughout the night. You can use it with a fleece queen-size blanket and flat sheet, and two people can sleep comfortably without getting too hot. The price is unbeatable, especially for the threadcount of the cover. I researched many other Websites and nothing could beat this price, even discount sites. Overstock.com's flat shipping fee of $2.95 was also great and was a factor in my decision to purchase both products. Great deal and convenient shopping. What more can you ask for...? I have at least one of these comforters in each size and love them. I also purchase a corresponding size duvet and use the twin or the full/queen just to cover me while napping (the cat loves it). On our bed, I use a sateen fitted bottom sheet and the king comforter with a sateen duvet as the top sheet; it's light, comfortable and warm enough for a great night's sleep. Sometimes the duvet of the same size is a little larger on the end and that allows me to tuck the duvet end under the foot of the mattress so it stays in place. The queen guest bed also gets one and guests feel quite special when they can curl up underneath one. These comforters hold their shape very well. Because the duvets keep them clean, I've not washed them yet but if they are washed in a commercial washer and dryer, I'm sure they will come out perfectly. I find that this alternative comforter is so much better for our use than a down comforter here on the Oregon coast. The winters get cold and the spring and summers are mild. This comforter fits the bill year round. 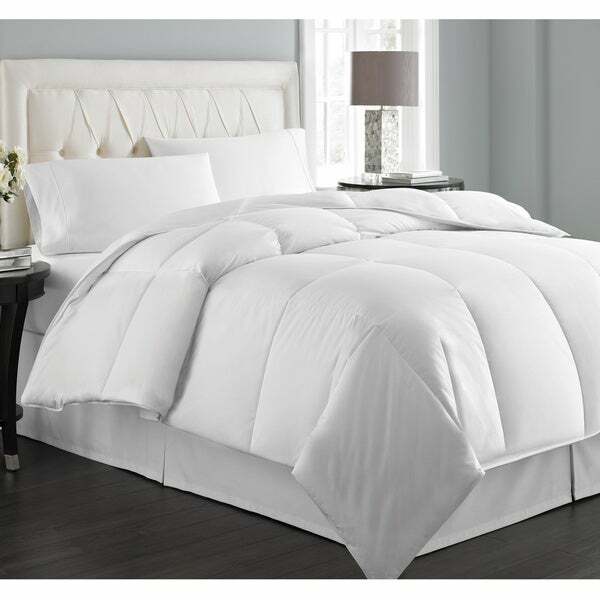 Whatever size you may need, this is a great comforter and the price is perfect! I don't think you will be disappointed. I needed a "lighter" comforter for the hot summer months here in Phoenix. Our air conditioning runs 24/7 and we keep our home on the cooler side, especially, at night. For the money, I got a real bargain. It fits great in its duvet cover. I am pleased with my purchase. I love this comforter. I followed the other suggestions of sizing up knowing today's deep-pocket, taller made bedding requires a size up for full top coverage with the 'flowing look' going equally down both bed sides. The shipping air compressed package arrived in 2 days; 10 minutes in the dryer removed all compress wrinkles visually making it appear Fluffier and a Wrinkle free Quality Comforter for the money. Being fussy I buy O.com's MACHINE WASHABLE duvet sets to envelope and prolong washing or costly dry cleaning King Size Comforters. As the Comforter arrived first we used it without the duvets finding it both light weight and comfortably warm that neither of us wanted to get up to make the coffee or get moving for the day. The color WHITE gave a clean fresh look to the contrasting Christmas Red extra pillows and sheets thanks to O.com's selections! I would not hesitate to recommend this comforter but suggest using a Machine Washable duvet not only to envelope protect the comforter from soiling but to lessen washing 'wear and tear' problems noted in another review. For the money I have repeatedly found O.com's quality better and prices lower than other retailers so I shop O.com regularly earning 5% bonus towards future purchases. I would definitely recommend this comforter to others. My husband and I needed a lighter-weight comforter to put inside our duvet for added warmth. This comforter fit the bill - it looked attractive, had the right amount of filling (puffiness), fit the duvet perfectly and was warm without being heavy. I purchased the comforter knowing that the king size comforter would fit a queen size duvet. And, that was absolutely true. So, as long as you are not looking for a true king-size comforter, it is perfect. Ordered the King size for a Queen bed and am glad I did because have just the right amount of overhang on each side. Quilt gives warmth without being too heavy. Would highly recommend it. When I recvd this item, I immediatly put it on my new king size bed to see how it looked and fit. It was WAY too small. I ordered a king and just covers the top of the mattress with no overhang at all! I have a queen bed in my extra room so I decided to use it for that room. I washed it and then used it that night on my king bed since I had just gotten the bed and had no comforter (I was expecting this one to fit) anyway...I found it is very noisy! Sounds like sleeping bag material rustling all nite! Not pleased at all with this purchase. this down alternantive comforter gives you all the excellent qualities you look for in true down with NONE of the headaches. Very washable! Actual size was bigger than expected. Very light and easy to wash! Not too heavy for warmer climates. WONDERFUL! Can't beat this for the price! I'm a pretty skeptical consumer and I am VERY pleased with this comforter for the price! It's weight and feel is very nice and super comfortable and cozy. I followed the other suggestions and bought a King for my Queen and it fits PERFECT in my duvet. Definately size UP! This was exactly as described and I am very pleased with it. The quality and workmanship is very good and it is true to size. I love this comforter. I purchased one almost 7 years ago through overstock and used it year around till it wore out. I received this new comforter and coudn't be more pleased. I am very satisfied with the quality, look and feel. Would recommend to anyone! I bought this as an insert for my duvet. I have a king bed and I was really looking for a comforter that would cover the entire bed. This comforter did not even quite fill the duvet. I was also hoping it would have been thicker. Meh didn’t work for me. I use it the guest room now. This comforter has done exactly what we wanted which is to provide enough warmth with a quilt on top, during the winter months, but still light weight enough to be comfortable year round. We've been very pleased with this product. This is the 2nd comforter that I bought. It is light, but keeps you warm. This comforter will not disappoint you. The comforter was constructed from nice fabric; however, it was extremely thin. The picture of this product certainly does not reflect the actual comforter. When constructed, it appears that only a single layer of polyfill was used. That's okey if you're only paying *** for a comforter, but to get that quality at a *** price tag is unacceptable. That's my reason for the return. Hate that too, because it cost *** to return plus the inconvenience of driving it to Staples. I'm a little disappointed in Overstock for misrepresenting the product as they did. I wish it was as plush as they show it to be! I'll be more cautious if ordering from Overstock again. I bought this comforter a few years ago, we still use it and it is still in excellent condition. I love the Alternative Down because little feathers do not poke you and I can wash it in the washing machine! love,love,love this comforter. It was a great value and the quality is just like a down comforter. Washes well and is very soft and warm on those cold winter nights. We bought this because of allergies to feathers. One nice feature of this purchase was the fact that the cotton cover was very high quality and satin like. This was a nice find. We loved this comforter when we bought it in a queen for a our guest room- so much so that we decided to replace our king down comforter on our own bed with one of these. It's great year round, yet we do live in Colorado, so we add a blanket in winter. *On a side note- we are totally done with down comforters! Alongside the animal cruelty issue that we learnt about, we are sick of how the feathers never stay even in down comforters. We have had a few over the years and the feathers always end up imbalanced- lots in one corner and very few in another. This non-down comforter stays perfectly balanced! I would recommend this comforter especially if you need a filler for a duvet, its how I'm using it. "Does this have any down in it? one of the reviewers said the label indicated it has down even though its down alternative comforter." "Does it have ties or loops to tie into duvet cover?" It is not a duvet cover. It is a comforter. You will only need this for the bedding, instead of two pieces for a duvet. "What does opal look like"
The Opal option is blue. "Are these shiny? Specifically the gray." "Does this comforter snag easily? I need it for kids' beds and we have animals." The answer is no snag from our daily use. In the cooler months we use a duvet cover. Warmer months a sheet and the comforter. "What thread count is this comforter? And about how would you describe the thickness of it?" 240 thread count it's what I expected . It comes compact sealed when open the bag it starts to unfold then keep it out for 48 hours to come to its fullness I love it . I like the thickness but it is pretty light. I sometimes get cold. During winter I'm sure I will need blankets with it. I have one at another house that is heavier but fabric sounds crinkly. This one does not. It really is nice. "Does this have duvet tabs?" No it doesn't. And even thought it states it's "all weather", it was too warm for me during the summer but will probably be fine for winter. It's not as fluffy as the picture shows it to be. No, it does not. Mine of very, very fluffy. And very, very warm. Everyone loves to sleep on top of them for the fluffiness without the heat.